I STINK at peeps in general but... I feel I can see a white rump here. So my GUESS is white-rumped sandpiper. If I'm seeing what I think I'm seeing, someone will confirm that. I find it interesting that some are flying with their legs extended and some are not. Is this normal? 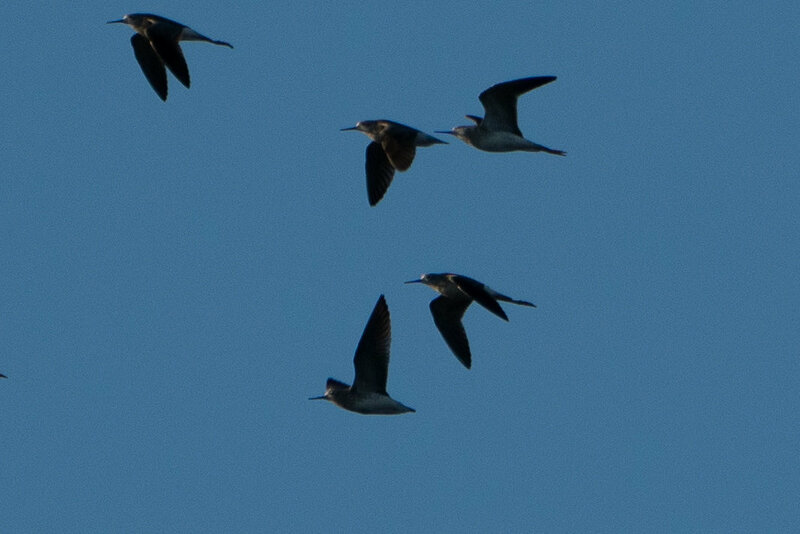 I'm seeing lesser yellowlegs as the birds with extended legs, the pattern on the underwing matches pretty well (shown in the upper rightmost bird). These aren’t peeps. I think Lesser Yellowlegs is correct. The term “peeps” usually refers to these five calidrids: Semipalm, Least, Western, White-rumped and Baird’s. I've taken a vow to never use the word except in describing the sound some chicks make. I think it may arouse more ire than 'seagulls' or 'Canadian Geese'. I'll stick with 'shorebirds' instead. Date could have been a useful feature. Yellowlegs, etc are in the genus tringa.